This was posted on the On Animation Blog but I thought I'd also mention it. 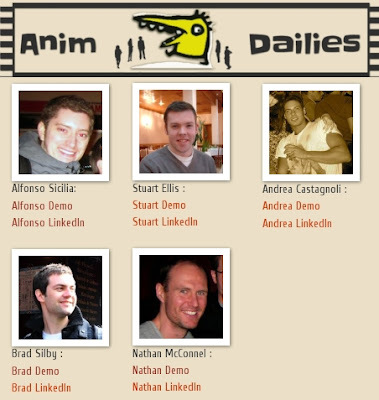 Anim Dailies is an online animation review site created by Alfonso Sicilia, Suart Ellis, Andrea Castognoli, Brad Silby and Nathan McConnel. You can submit your reel or piece of animation and receive constructive feedback on your work from friendly professional animators. I'm fortunate enough to know and have worked with these guys and would heartily recommend utilizing this site. They are exceedingly talented and experienced animators so if you're looking to further you animation skills, I wouldn't pass up this great opportunity to receive a free critique from a top animator. Here's the first trailer for John Carter, the film I'm currently working on. There isn't any of my work in it, in fact they seem to be keeping almost all of the great work being done here at Double Negative under wraps for now ... I guess that's why it's called a teaser.